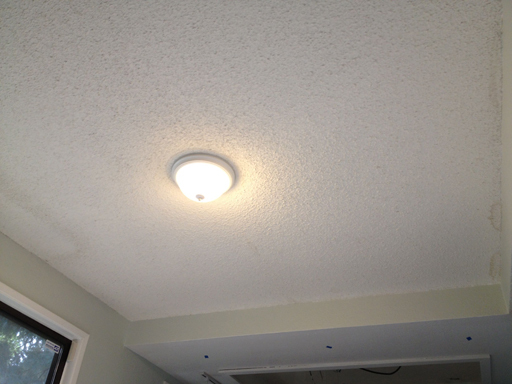 Oh, how I hate popcorn ceiling texture. But we are in the “popcorn ceiling” income bracket. The houses we looked at… they’ve got a history! Very dark histories involving a very ugly, lumpy ceiling texture. It’s gross: it falls down on its own, it traps cobwebs, and if you’ve got any water stains on your ceiling, well, they’re impossible to remove if you’ve also got popcorn. I tried my hand at popcorn removal a year ago, but that was more a practice in mess-making and cursing. I found a contractor online who would do the job for the kitchen, dining room, living room, and entry hall for about $1300. The end result was absolutely 100% worth it, but I didn’t really know what to expect going in. 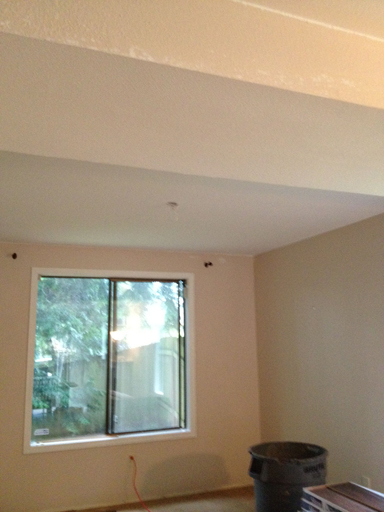 I’m gonna lay it all out here for other folks who might be interested in professional ceiling texture popcorn removal. 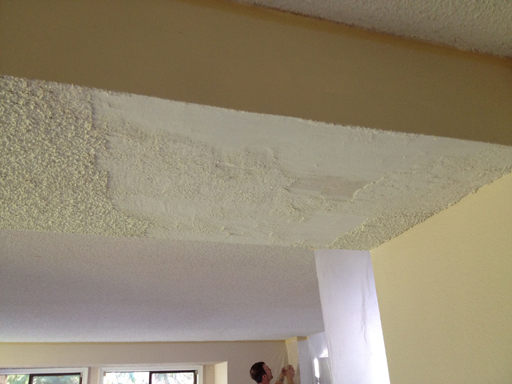 Step 1: You have to test your popcorn ceiling texture for asbestos content. A pro won’t touch this job unless you do this step first. We let this discourage us for a long time because we thought it’d be difficult, but it’s quite simple. You scrape some into a plastic sandwich bag and take it to (or mail it, perhaps) to a testing facility. Our test facility was right in town and all we had to do was drop it off and pay $35. We had results in two days. Results = NOT ASBESTOS! Step 2: Find a contractor (or a few) and get a bid! Day 1, Monday afternoon: Steve and his assistant (just two guys!) got down to business: in 20 minutes the entire work area was covered in plastic. Two hours later, the popcorn was history. I don’t know what sorcery they used to remove it, but that crap came down turbo speed. They then hauled away all the popcorn mush and left for the day. 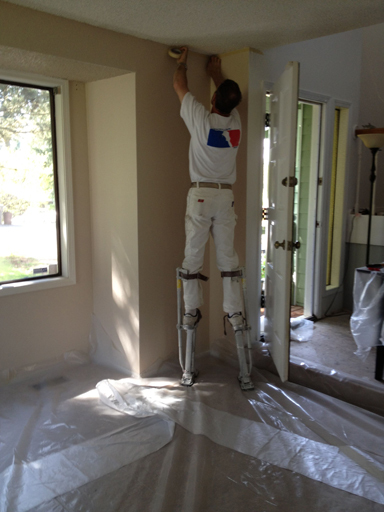 Side note: the stilts they used were freaking awesome. Monday night: We now live in the house from ET. 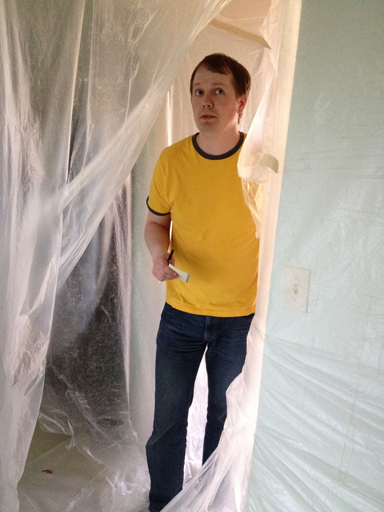 Day 2, Tuesday afternoon: Steve returned to blast texture all over the ceiling. With some kind of paint gun. It was awesome. He was in and out in under 2 hours. Living amid all this plastic was starting to wear on us, but Wednesday was the final day of work. Day 3, Wednesday: Steve’s first visit on Wednesday was to blast on the first coat of paint, and then he left, promising to return around 3pm to shoot on a second coat of paint if the ceiling happened to be dry by then. If not, it would have to wait until Thursday, but that would conflict with our flooring so it that ceiling had to get DRY! Jim and I rushed home over our lunch break and the three of us (Jim, Dad, and myself) blasted the ceiling with hairdryers and fans. 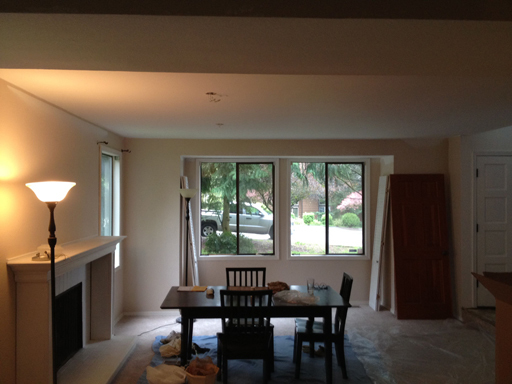 After the paint was power-dried, Steve returned in the afternoon, declared it dry enough, and completed the last coat. Cleanup was fast, and with the project fully behind us it’s safe to say now that it was TOTALLY WORTH IT!! Look at these flat, shiny ceilings. You could ice skate on these babies. Wow, what an improvement!! Of course, the house remains a mess as flooring is already underway. 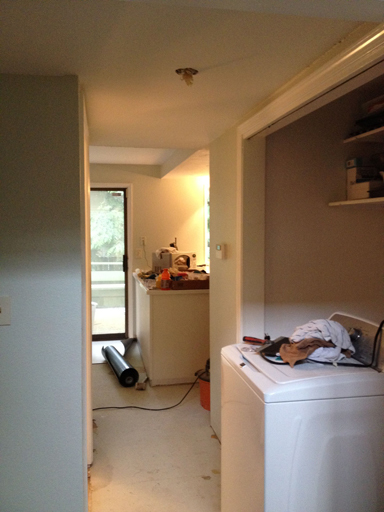 Scheduling back to back contractors was risky, but everything’s worked out perfectly. The living room is so much more sleek, shiny, and bright! !